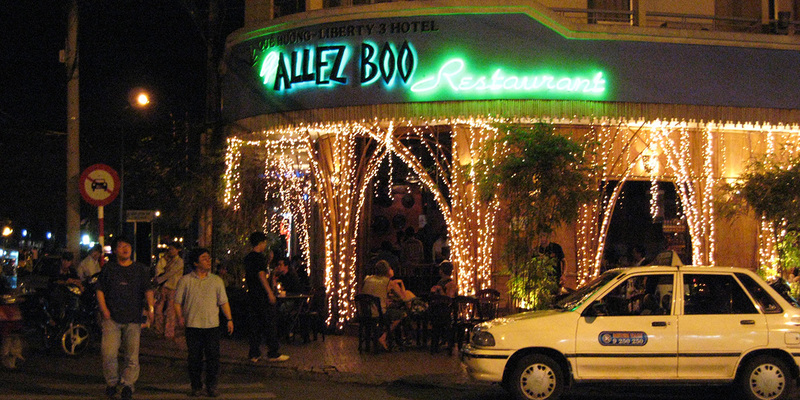 Allez Boo is a backpackers bar and restaurant located on the corner of Pham Ngu Lao and De Tham Streets. The beer here is reasonably priced but mixed drinks are a little expensive for the area. There is also a service charge after 1:00am which adds a little extra to the price of drinks and food. Music is good with the house DJ playing popular rock, pop and dance tunes. Allez Boo was also the winner of The Guide Awards 2005 for Most Popular Cheap Eats Restaurant. Nice bar, nice music ( a bit too noisy sometime ) Price are ok, many tourists. Good place to have a break when you are running around the area. Am sitting in the bar with my partner and the drinks are terrible! Ordered mojito, dry martini and margarita but it’s not worth it at all. Not happy! We’ll go elsewhere later seeing that we will be in HCMC for some time. My take? Go only if you feel like wasting money. Terrible drinks, expensive prices. Seems to get backpacker crowd by arrangement with hostels. Lacks anything enticing! been to Saigon late Oct. 2013, and I would still rate Allez Boo a way over exaggerated small café with sometimes loud music, overpriced drinks and food, and sometimes quite strange patrons.